This is my first brew from Winnipeg's Half Pints Brewing Company - I can almost taste the excitement! Well... I guess I'm about to. It's you who will be able to almost taste it, I guess. Even being a stout, I was surprised at how dark this was coming out of the bottle. It was like a deep mahogany. In the glass, it's nearly black with just traces of reddish colour and light at a couple of edges. The head is of a decent amount (as you can see), light brown, and is fairly creamy. In the aroma is a healthy dose of coffee beans and chocolate - it reminds me of chocolate-coated espresso beans. The taste? Pretty much the same as the nose! I've got to say that this beer utilizes the coffee component about as well as any other beer I have had. It's a bit rich, a bit malty-sweet, a bit woody, & it has lots of coffee flavour (with a bit of cream, no less - perhaps that's coming from the lesser chocolate notes). The feel is rather what you'd expect, perhaps - it feels just like a cold coffee with some light carbonation. A fairly light and watery (yet smooth) mouthfeel finishes off with a bit of dry bitterness in the mouth. 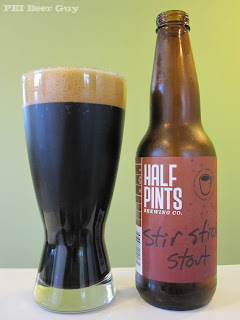 Normally, I like my stouts a little heavier, but this one's lighter traits seem to suit it. A great little coffee stout. I wouldn't hesitate picking this one up if it ever found itself in front of me again.